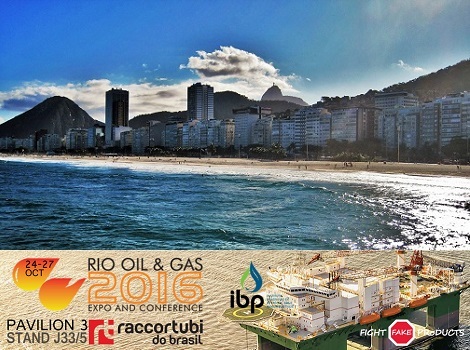 Despite the ongoing market climate for the Oil & Gas industry, Raccortubi do Brasil will be exhibiting once again at Rio Oil & Gas 2016 from 24th to 27th October. Raccortubi do Brasil is looking forward to meeting customers and making new contacts at the event. It is offering regional customers stockholding and distribution of piping materials, with a special emphasis on duplex and superduplex to satisfy the needs of the local offshore industry. With an extensive warehouse in São Paulo at its disposal, it supplies customers with complete project packages of pipes, fittings and flanges, as well as ex-stock material for maintenance and urgent requirements. With the Rio Oil & Gas Conference focusing on “Pathways to a Competitive Oil Industry”, the technical programme will cover a range of topics from upstream and downstream, gas and energy, to governance, sustainability, compliance and geopolitics. Raccortubi do Brasil believes that it fits perfectly into Brazil’s new approach and intends to be part of this renewed landscape for years to come. Raccortubi do Brasil is ready to welcome visitors to its Stand J33/35 in Pavilion 3. For more information regarding the event, please go to: www.riooilgas.com.br.